DALLAS, July 23, 2018 /PRNewswire/ -- Just 16 percent of Medicare plan members with chronic conditions responded that their plan knows when their personal health is getting better or worse. Forty-six percent (46%) responded that their plan never communicates with them about their chronic condition, and another 19 percent noted communication only one time per year. Despite these low numbers, sixty-two percent (62%) say their health plan does know them well. The results are from a HealthMine survey of 781 Medicare plan members fielded in June/July 2018. 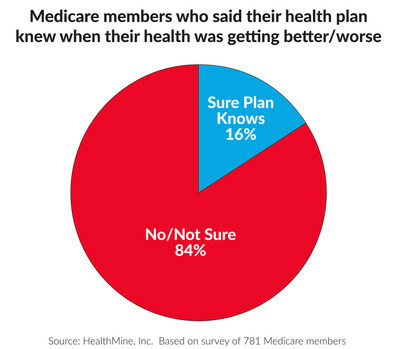 Medicare members who said their health plan knew when their health was getting better/worse. 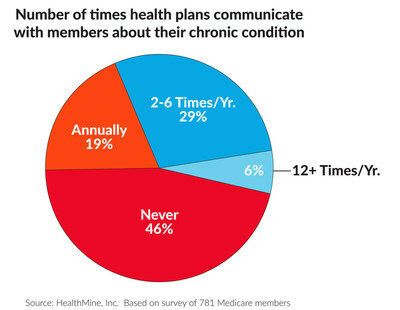 Number of times health plans communicate with members about their chronic condition. According to the National Center for Chronic Disease Prevention and Health Promotion, three in four Americans aged 65 and older have multiple chronic conditions. Top chronic conditions self-reported by Medicare members were hypertension 66 percent, hyperlipidemia 42 percent, and diabetes 25 percent. Bryce Williams, president and CEO of HealthMine, commented, "Despite the perceptions of Medicare members, health plans are increasingly using data to connect with and provide meaningful, timely help and reminders to members. We are partnering with Medicare plans to provide algorithms that analyze clinical data to help members better manage disease, and help plans to better manage cost." Other results show that 38 percent of members would like their health plan to communicate with them throughout the year about their chronic condition. Only 15 percent said their plan provides regular reminders and recommendations about their chronic condition. Do Medicare members think their health plan knows when their health is getting better/worse? The HealthMine Medicare Survey queried 781 insured age 65+ consumers with a chronic condition who are enrolled in a Medicare Advantage and/or Supplemental plan. The survey was fielded by Survey Sampling International (SSI) in June/July 2018. Data were collected via an opt-in panel. The margin of error was three percent (3%). Survey Sampling International (SSI) has been the Worldwide Leader in Survey Sampling and Data Collection Solutions, across every mode, for more than forty years. HealthMine is the only member-centric clinical technology company with a platform built inside a Value-Based Insurance Design (VBID) health plan. It is specifically designed to identify risks earlier and close gaps in care faster. The HealthMine solution consists of Automatic Health, a clinical analytics platform, that generates insights and recommendations. It includes Opportunity Manager, an application that gives plans continuous access to data, insights, and recommended interventions generated by the clinical analytics platform, prioritized by projected revenue and cost savings opportunities and the Personal Health Assistant consumer application that empowers plan members to manage their health. HealthMine is on the web at www.healthmine.com.